The practice of office ergonomics is to obtain the perfect comfort level to maximize productivity, safety, and well-being, while enhancing effective interaction with colleagues as well as technology. Office ergonomics revolves around the philosophy that furniture should facilitate a healthy range of motion to minimize injury and boost productivity. What Can Be Done to Improve Ergonomics? Making sure your office furniture is ergonomically effective is the best way to improve physical movement. You can achieve maximum ergonomics by purchasing new furnishings, technology, and any office object that improves physical well-being. Make sure the range of flexibility of your office furnishings aligns with the appropriate physical dimensions needed to accommodate any employee. The benefits of ergonomic furniture and technology includes possible reduction of physical pain caused by a sedentary or ill-fitting work environment, increased productivity and decreased down time due to physical pain or illness. Some of these physical improvements can include improved posture, reduced neck and eyestrain, and better wrist function. Your mother always told you to sit and stand up straight - and for good reason! Poor posture can be the cause of aggravated back and neck pain, damage to the spine, and even herniated discs. You can control these factors by improving ergonomics in your office. How can you optimize your posture? By making sure furniture such as your desk and chair are the right size and possess the right structure to keep your posture upright. Sometimes you get stuck with old office desk that was designed for utility and not ergonomics. You want to make sure if you're using a sitting desk, that it possesses computer alcoves, adjustable keypad shelves, and the ability to be physically adjusted to personalize space and comfort. Not every person is the same height – sitting desks should be able to be personalized to fit you best. While standing desks are more physically demanding of your body throughout the day, if you are able to stand, this desk has many positive benefits. Studies suggest that people who sit for long hours at work are at higher risk for physical ailments and injuries. 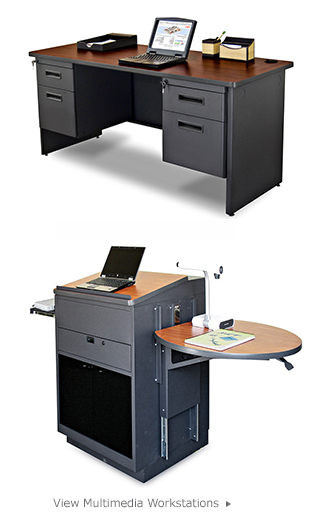 Standing desks have the added benefit of improving posture by keeping you standing upright. The standing desk allows you to burn more calories throughout the day versus a sitting desk, and it allows you to process that big lunch by improving circulation and metabolic function. This might result in less weight gain in the long run, which puts less strain on your back and legs. Standing desks ultimately allows you to focus more on your work because you are not longer straining to get comfortable within the confines of a desk chair. Picking the right office chair can greatly improve posture. An office chair should be comfortable, customizable, and provide support. 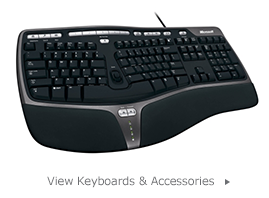 Adjusting seat height, arm height, lumbar support, and degree of tilt means more comfort and less slouching. Because you spend almost half of your day sitting, your office chair needs to have a comfortable, supportive seat and an ergonomic back. 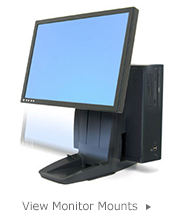 Monitor stands allow you to adjust the height and position of your monitor to assure comfort for your neck and head. It allows you to make sure your eyes are able to focus on your monitor without strain. Monitor stands help customize the height and location of your monitor, which in the long run will improve posture and increase ergonomics. Often, we don't notice there is a problem with the ergonomics of our work environment until we start feeling pain or discomfort. Make sure your furniture is able to accommodate your height, which will allow you to strain less and focus more. Make sure your arms have enough room to be parallel with the floor and not have to bend and put strain on the neck and back. Your feet should always be square on the floor to make sure you have ample ability to sit up straight, stretching your spine and neck to avoid muscle cramping. 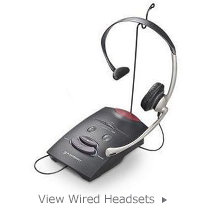 If you are on the phone the majority of your day, consider investing in a headset that allows minimum tilting and straining of the neck. Make sure when you are choosing a computer monitor that has maximum clarity (does not have an issue with "static contrast ratio" and uses finely sharpened images that make the display easier to read.) Additionally, reducing glare can help reduce eye strain. Privacy filters are used to reduce glare and harsh light. They can help increase readability by eliminating excessive glare from your computer screen. Glare may increase instances of chronic headaches or even lead to the weakening of your eye muscles. With a privacy filter, whether you use an LCD monitor, a laptop, or CRT, you will be able to work much longer at your computer with less discomfort. To help you avoid painful and chronic physical ailments like aggravated arthritis, tendonitis, and carpel tunnel syndrome, it is important to take your wrist, hand, and arm health into account when you consider workplace ergonomics. There are several office accessories that can help reduce the effects of long hours of repeated motions. The advantage of an ergonomic keyboard is the ability to reduce muscle strain, which might reduce the risk of carpel tunnel syndrome and other injuries that come as a result of repetitive motion. Ergonomic placement of your hands and wrists provides optimal flexibility and may protect against arm, hand, and wrist discomfort. When deciding on a keyboard, the ergonomically designed keyboards angle your wrists so they stay straight as you lay your fingers on the home row of keys. The track ball mouse is designed to maximize comfort for your wrists and hands when using a mouse. The track ball mouse aids in movement without focusing strain on the wrist and hand and keeps your wrist in a position that may reduce risk of injury. 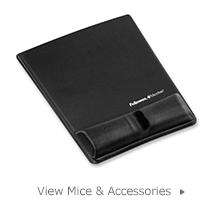 Wrist pads can be an addition to any mouse or keyboard. Wrist pads are ergonomically advantageous because when memory foam or gel supports the wrist it allows a cradling space to neutralize the pressure points and decrease the pain associated with restrictive motion and discomfort. They also keep your wrists straight for the duration of your workday. Small changes around your office will eventually add up to better overall ergonomics. Avoid physical pitfalls such as awkward posture, repetitive motion with lack of support, inadequate space for range of motion, eye and neck strain by taking advantage of office ergonomics. The design objectives of office ergonomics should support a healthy body and human-centered design, which will improve natural posture, eye health, neck health, and wrist and arm function. Improved health means less downtime and more productivity – so make office ergonomics work for you today!